W. W. Norton & Company, 9780393351088, 400pp. 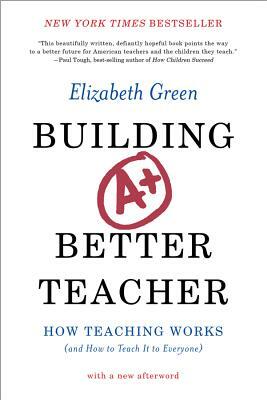 Launched with a hugely popular New York Times Magazine cover story, Building a Better Teacher sparked a national conversation about teacher quality and established Elizabeth Green as a leading voice in education. Green's fascinating and accessible narrative dispels the common myth of the "natural-born teacher" and introduces maverick educators exploring the science behind their art. Her dramatic account reveals that great teaching is not magic, but a skill--a skill that can be taught. Now with a new afterword that offers a guide on how to identify--and support--great teachers, this provocative and hopeful book "should be part of every new teacher's education" (Washington Post).